I am always looking for ways to help teachers deal with the grading load that comes with teaching English. (See previous posts Resources for Grading Essays and Giving Effective Feedback and Incorporating Student Reflection: Effective Efficient Feedback Continued). Then today, Ben Baptist showed me the voice comment feature in Turnitin.com, and I thought it was another great tool to give efficient and helpful feedback to students. It is also very easy to use for teachers. Ben and I experimented with the tool by grading the same six-page AP essay at the same time. He typed his comments using the traditional Turnitin.com commenting tools, and I inserted a generic “Voice Comment” to highlighted text and then recorded each voice comment as I read the paper. I was able to complete my comments on the essay four minutes earlier than Baptist, which means that for his 85 AP essays, using the voice comment feature could save him five hours and forty minutes! 1. When you open a paper to grade it, click on the icon that is the second from the right icon (see highlighted icon below). 2. When you click this box, you will see the following screen. I have clicked “record” in this screen shot by selecting the microphone. 5. From here, you can begin voice comments. The feature can be paused and restarted, so I commented on the paper as I went by highlighting text, adding a Quickmark comment I created called “Voice Comment,” and then recording my actual voice comments as I went along. I would start my comments by saying aloud, comment one, comment two etc. When I finished reading the paper, I added my overall feedback at the end. In total, my voice comments were about a minute and a half; you can record up to three minutes of comments. 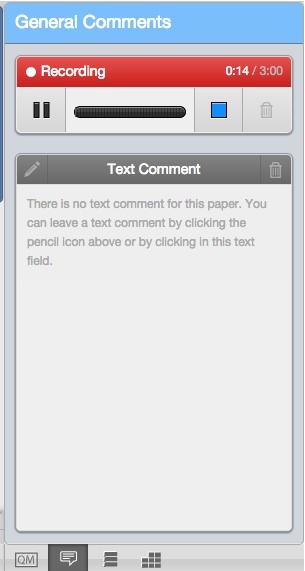 If teachers decide to use this feature, please send me feedback and let me know how it goes!